Andrea Quiberoni, independent researcher of the Council. 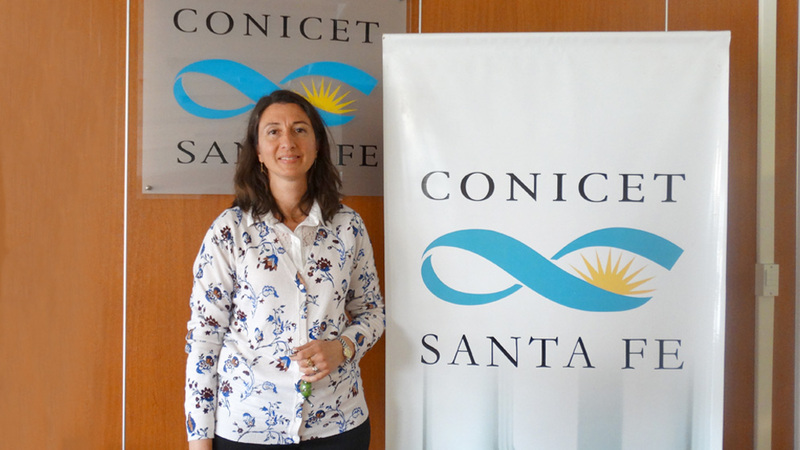 Photo: CONICET Photography. The word bacteria tends to be put on the same level as infections or diseases, but not all bacteria are bad. Within the beneficial ones to the human being, it is possible to find the lactic acid bacterium (LAB). These are a group of benign microorganisms that produce lactic acid from sugar fermentation. For this reason, they have been used for more than four thousands years in the production of fermented milk products, like yogurt and cheese, among others. The LABs trigger a microbial process where they transform the –sugar in milk- in lactic acid. That acid modifies the structure of the milk proteins making them curdle and reproducing the same effect on the product’s texture. Besides it provides the milk with that characteristic slightly bitter taste. It was proved that these microorganisms provide beneficial effects on the health of those who consume them. Furthermore, it suppliments the health with the bacterium present in the intestinal flora promoting the good performance of the digestive system. For this reason, they are very important for dairy industry considering the context of growing interest in the market of probiotic products. Nevertheless, these ‘good bacterium’ have a foe: the bacteriophages, which viruses that infect them. Andrea Quiberoni, CONICET independent researcher, leads a research team at the Instituto de Lactología Industrial (INLAIN, CONICET-UNL) [Institute of Industrial Lactology] that works with dairy industries of all the country in order to detect and develop technology strategies to reduce its effects. “They are the bad ones, the bitter enemies of the industry. As all viruses, they need a sensitive host cell to infect, in which they develop its progeny using all the biosynthetic machinery and the genetic material of that bacterium. As a result, those new virions infect the neighbouring bacteria that develop in the same medium. What is the origin of the phages? As all viruses, they are in the environment, and the main path through which the phages can enter the plant is the raw material. Great volumes of raw milk are the main entrance path: they have wild lactic bacterium and its specific phages. For this reason, and due to the fact that its presence cannot be avoided unfortunately, the scientists study how to control them instead of eliminating them”, Quiberoni explains. The researcher describes that when a bacteriophage attacks a bacterium, it is destroyed: there is no acidification and no pH decrease. This causes a failure in the fermentation developing low quality products that are not safe from a microbiological point of view because they can contain contaminants and/or pathogens that do not have to compete with the lactic bacteria that protect the product. Thus, the dairy industry becomes a victim of severe economic losses resulting from these failures. However, the phages are innocuous for humans. The first specific bacteriophages of lactic bacterium were identified in 1935, in New Zealand, by two researchers who used BAL of Lactococcus genus in lactocaseario productions. After experiencing some failures during the fermentation, the scientists came to the conclusion that there were viruses that attacked the bacteria. From then on, the researchers isolated specific phages of all lactic bacteria genera and species used by the industry: Lactococcus, which is widely used in the worldm; Streptococcus termophilus, which represents the mostly used kind of BAL species in our country; Leuconostoc, the main bacteria for the production of blue cheese, butter and cream; and Lactobacillus, the BAL genus that groups the highest number and diversity of species. In the last few years, researchers detected a growing number and diversity of these viruses. So far, it is known that between 0.1 % and 10% of the lactic production batchs have phages to greater or lesser extent and its presence in the industrial environment is inevitable. To make matters worse, it has been determined that they have a high frequency of mutation and thermo resistance. “There is a considerable increase in very thermo resistant phages. When I began my theses, 23 years ago, most of them were eliminated with simple pasteurization. 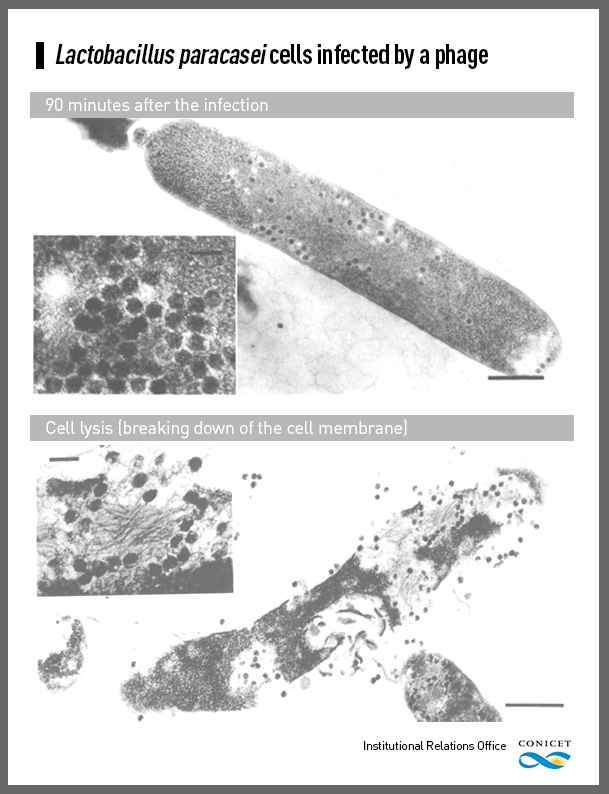 Nowadays, there are phages that resist up to 45’ in 90ºC with milk, and it is impossible. The efficiency of the thermal treatment is going to depend on the phage population because as there are very resistant phages, there are other more sensitive, and they are also going to depend on the initial level of infection and the suspension method.The negative implications of the phages in industry have been intensified in the last period of time, as the recycling of some products derived mainly from whey became important. We specifically found BAL phages in whey permeate samples and whey protein concentrate; if these products are reutilized in a new fermentation, we are sowing phages directly”, Quiberoni states. Nowadays and after many years of research around the world, in order to face these infections, the dairy industry has several strategies to avoid phage propagation and evolution. Some of them are: thermal treatments of raw material that even though they were develop to sanitize and not to eliminate phages, they will prevent this type of infections; crop rotation programmes with more resistant strains, that is to say, to use different initial fermentations and alternate them to avoid phages’ attack on the same strain; the hygiene and design of the plant, which aim to sanitize the environment and the own equipment of the process, collaborating with phage control; the use of direct crop inoculation in tub to avoid previous propagations of the bacterium. It is worth mentioning that none of these strategies alone can protect one hundred per cent of the phage infection production. They should be used together, and a great number of them. For more than 23 years, the INLAIN works with the dairy industry sector to confront these viruses. Jorge Reinheimer, CONICET researcher and director of the institute comments that they began technology transference in the 70s and at that time the relationship between the industry and the university was broken. They spoke ‘different languages’ because the companies did not hire so many professionals and considered the academic world as something distant. “We are in a milk production area and we should modify that situation because the researchers have useful knowledge for the industry and the interaction allows us to know their reality. There were many interesting subjects for the productive sector but they could not be studied in the country; so we went abroad and researched into those particular subjects that later on we provided the industry with that knowledge. In Argentina, before the 90s there was no laboratory available in which I could work with bacteriophage infections. At that time, the industry began to hire more professionals, grew more and more and the accidents caused by infections produced by phages were devastating. When I came back to the country, we adapted the laboratory to work with phages and at this moment we are experts on this subject”, the researcher explains. Some of the INLAIN services for dairy companies are the detection and quantification of BAL bacteriophages in all kind of samples of the industry (raw material, supplies, whey, fermented milk, etc.). This procedure is essential because from the moment we know they are present and the number of them, it is possible to determine the most suitable strategies to counteract their effects. The researchers also study which are the most effective sanitizers or biocides available in the productive sector, how many minutes should they be used and at what temperature for the phage collection at the Institute and for those ones that the industry wish to test. Besides, the scientists offer advice for the design of effective thermal treatments for phage inactivation. Another service allows scientists to study the degree of phage resistance of different BAL against selected phages. These services are useful for the dairy industry and lactic ferment producers so as to be able to choose the strains with the best technological and phage resistant properties. “Phages are the biological entibies more abundant in the planet. They are constantly evolving and even more in the environment of an industrial plant, with lactic bacteria in constant multiplication, allowing them to evolve and create growing and huge phage diversity. From our place and from the industry, it is only possible to think and design new strategies to tackle infections”, Quiberoni concludes.